Within contemporary trends, we are seeing an ever-increasing lean towards a synthesis of different styles, often styles which conventionally seem to oppose one another. This seems a great leap forward from architectural trends of only a few years ago, where the purist notion of either one or the other had been in the foreground. Well today, we will visit one such project that incorporates different and seemingly contrasting style, in this case, the rustic and the modern. There is no doubt that this residence is an architectural triumph on the whole, but we are also sure you’ll agree its merit reach far beyond a stylish façade and interior. Why don’t you join us to take a closer look? The Casa da Montanha is the brainchild of David Guerra Architects and Interiors, based in Belo Horizonte, Brazil. As what is evident here, the building certainly has structural traits which are distinctly modern, such as the geometric features and cubic design. 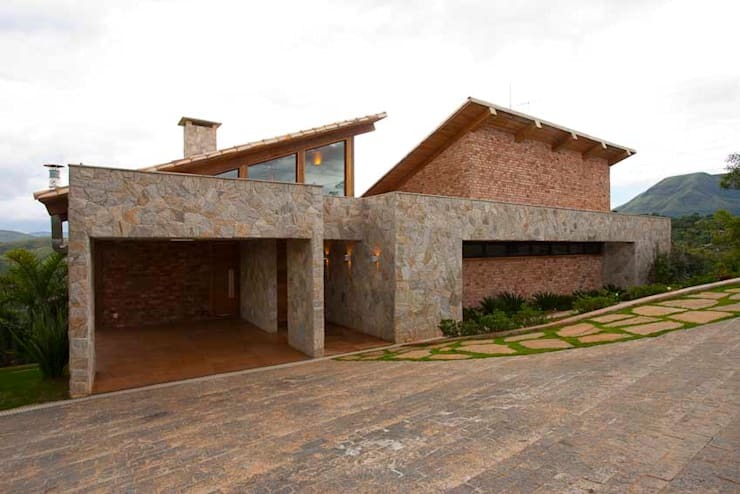 The façade is also, however, coated in a raw stone tiles, which offers a rustic contribution to the composition. The synthesis of styles will become more evident as we progress along in the project, but here we are already introduced to the eclectic nature of the building. We can take time to admire the natural surroundings wherein the residence is located, and the rustic elements of the façade are no doubt meant to resonate with the environment. 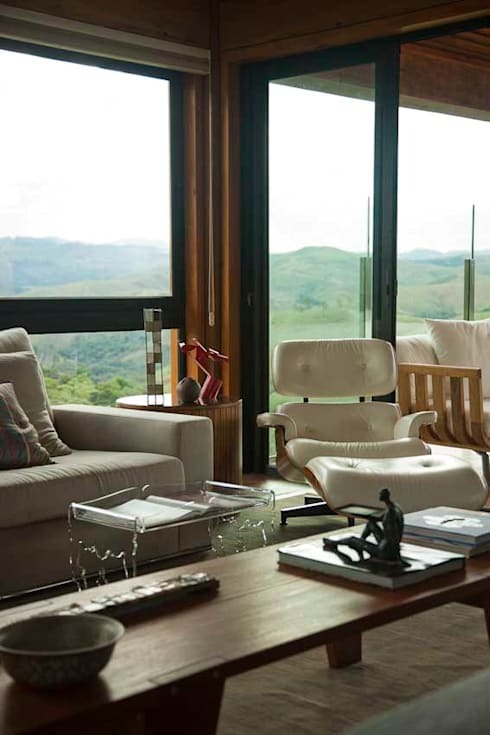 The Casa da Montanha (literally meaning 'mountain house') is aptly named such, since it is found in the beautiful mountainous region of Nova Lima, Brazil. As we can see here, the building is situated among lush greenery in the region, and whoever inhabits this home must have unceasing panoramic views. The view we have of the house here, is much more modern than what we saw in the introductory image. This wonderfully demonstrates the marriage of styles in this contemporary design. The raised volume is covered by a slanted wooden roof, altogether making this a towering modern structure. We also see a spacious, clear pool bordered by terracotta tiles and glass balustrades. Before exploring several spaces inside of the home, let's take a moment to zoom in on some details in the living room. If we were to show-wide shots of the area, we think most would be overwhelmed, since the project us rich in detail. Here we can see some of the furniture and decorations that set the tone of the style throughout the house. The first observable characteristic of the style is the use of neutral colours. Not only is this a popular modern trend, but it also creates a calm and comfortable atmosphere well suited to the natural surroundings of the building. Then we also see leather, sued, wood, and even perspex used as materials for the constituent part of the ensemble. This variance in textiles creates ample variety in lieu of a more varied colour scheme. Welcome to the kitchen of this spectacular home. 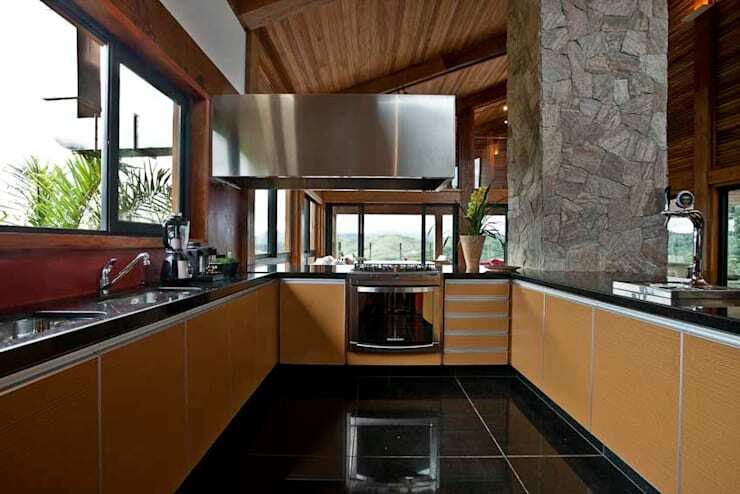 This is a very exciting home indeed, with the use of bright, burnt umber colour for the cabinets, sleek black stone tiles, and ample stainless steel finishes. With all of these elements, it is a very modern kitchen, but we can once again see the rustic influences coming through: in the back we see a column covered in rough stone tiles, as well as the uncovered wooden roof and accompanying rafters. The burnt umber cabinets we have mentioned is certainly the focal point in the kitchen, and brings a sense of liveliness to the area. This colour also contrasts starkly with the black counter tops and floor, creating a dynamic environment full of energy. Here we are in the main bathroom of the house. Once again we see elements of the rustic (wood and warm colours) and the modern (geometric forms, metal finishes). 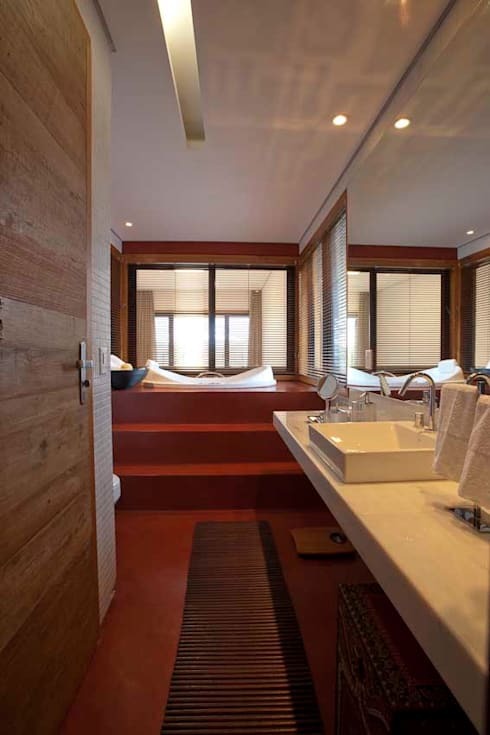 The concrete floor in the room is painted in terracotta colour, rendering the atmosphere warm and inviting—perfect for the intimacy of the bathroom. The spectacular bathtub is situated on tiers of stairs like a royal throne. This ensures seclusion and immersion for a holistic and relaxing experience. The white counter top on which the bathroom sink is situated, is made from luxurious marble, adding classic elegance to the space. I large mirror covers the entire space behind the basin, enlarging the visual space in the room. We end off our tour of this eclectic masterpiece on the porch. We just can't stay away from the magnificent scenery for too long! The rustic porch is housed underneath an impressive wooden canopy extending out from the building. This structure consists of a bold frame and think pieces of wood layered on top of each other. This creates a beautifully detailed effect with natural tones. Modern furniture graces the porch, with luxurious lounging chairs and a bright red dining set at the back. 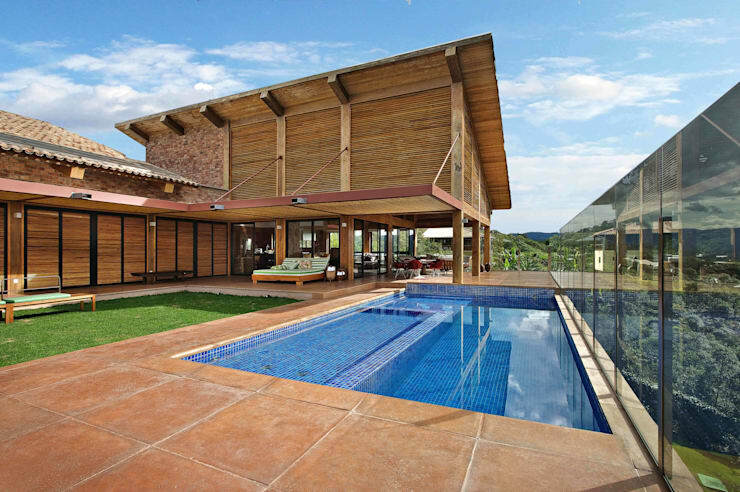 Behind this, we can see the pool and the natural landscape stretch on into the mountains. A man-made masterpiece in a piece of a natural wonder! 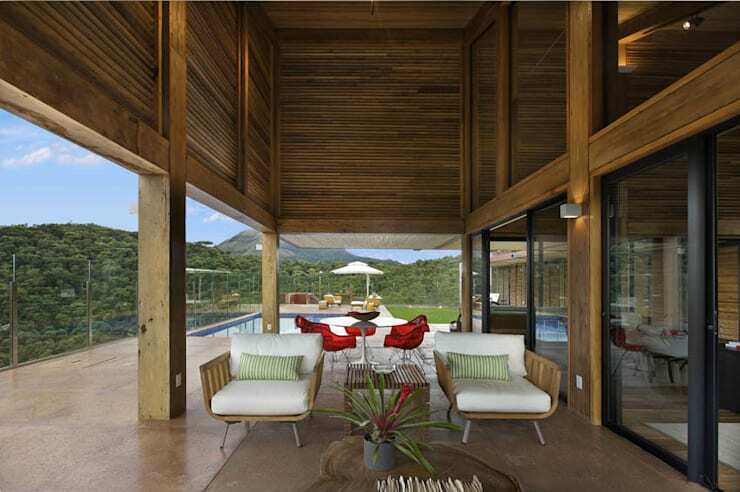 For another Brazilian house in a beautiful natural setting, take a look at this project. What do you think about the warm colour scheme of the house? Do you like the design? Let us know in the comments!